SOFIA is also the acronym of a well known report published every two years by FAO about The State of World Fisheries and Aquaculture. The 2018 edition of SOFIA emphasizes the sector’s role in achieving the 2030 Agenda for Sustainable Development and the Sustainable Development Goals. As in past editions, SOFIA makes an analysis of the major trends and patterns observed in global fisheries and aquaculture, and it reviews new and upcoming topics and areas that need to be considered when managing aquatic resources. SOFIA 2018 is available in the five FAO official languages (Arabic, Chinese, French, Russian and Spanish). It can be downloaded here in PDF format, and for the first time in MOBI and E-PUB versions too. The analysis on the major trends and patterns made by SOFIA is done at global scale and at regional level (Asia excluding China, China, Africa, Americas, Europe and Oceania). However, SOFIA doesn’t forget its origin, as the Mediterranean and Black Sea is one of the 16 FAO major statistical areas used to analyze capture production. Moreover, SOFIA includes photos and illustrations from our region, e.g. 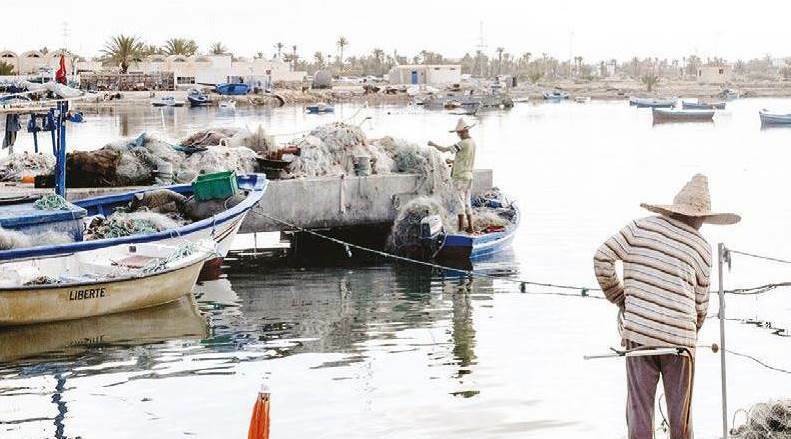 Photo of Fishers in the port of Ajim, Djerba Island, Tunisia [Look at the name of the artisanal boat: LIBERTE], or Box 29. Supporting sustainable aquaculture development at the regional and subregional level: the example of the General Fisheries Commission for the Mediterranean. PART 1 – WORLD REVIEW is based on FAO’s official fishery and aquaculture statistics. Unfortunately, those interested in Mediterranean aquaculture won’t find aggregate data for our region and thus should look at other sources. You can make your own analysis by accessing the FAO web section on Statistics of the Fisheries and Aquaculture Department, here; or alternatively search for other sources, such as the General Fisheries Commission for the Mediterranean (GFCM), i.e. the report of the tenth session of the GFCM Scientific Advisory Committee on Aquaculture (CAQ) held in Izmir, Turkey, 27–29 March 2017, here. This GFCM report points out that for 2014, the production of Mediterranean and Black Sea bordering countries reached 2,381,954 tonnes, with an economic value estimated at around USD 6.8 billion, which represents 2.2 % and 2.8 % of global production and value respectively. Following similar trends as those at global scale, aquaculture production in the Mediterranean and Black Sea riparian countries is expected to continue growing and reach over 4,600,000 tonnes in 2020–2030. Besides the reviews on production trends, found in PART 1 (World review), SOFIA 2018 also has three more chapters: PART 2 (FAO fisheries and aquaculture in action); PART 3 (Highlights of ongoing studies); and PART 4 (Outlook and emerging issues). PART 2 – FAO FISHERIES AND AQUACULTURE IN ACTION, starts with a short review of the United Nations 2030 Agenda for Sustainable Development. The Sustainable Development Goals (SDGs) and related ongoing international and national processes are highly relevant to the fisheries and aquaculture sector, including fish processing and trade, and in particular to the sector’s governance, policy, investment and capacity development needs, to stakeholder participation and collaboration and to international partnerships. It also points out how Regional Fisheries Bodies (RFBs), and Regional Fisheries Management Organizations (RFMOs), among other institutions are working on SDG 14 target components (see reference FAO, 2017d). SOFIA has traditionally focused more on capture fisheries, but now incorporates more subjects on aquaculture. PART 2 is specifically addressed in two sections: i) Biodiversity, fisheries and aquaculture and ii) Implementing the ecosystem approach to fisheries and aquaculture. FAO is highly concerned about the management of Aquatic Genetic Resources (AqGR). FAO points out how many countries have limited policy frameworks and legislation for managing and conserving AqGR and currently lack the capacity and/or the resources to collect and report information on aquatic genetic diversity. The increasing scope for use and trade of genetic resources (page 107) requires policy-makers, government resource managers, the aquaculture private sector and rural communities to implement new approaches to management and responsible use of these resources and genetic technologies (e.g. selective breeding, hybridization and genetic characterization). SOFIA also reports about five thematic background studies on AqGR produced by FAO and available on its web page (www.fao.org/aquatic-genetic-resources/background/sow/background-studies). Worthy to mention the document about Genome-based Biotechnologies in Aquaculture for its extensive review about the genetic technologies in use, but also for its last section about technical, ethical and legislative challenges for the application of genome-based technologies in aquaculture. PART 2 also reviews the implementation of the Ecosystem Approach to Fisheries (EAF) and Aquaculture (EAA). Within EAA, Aquaculture Spatial Planning is presented as a tool offering many specific opportunities, including disease risk prevention and management; ensuring that aquaculture operations stay within the ecosystem’s carrying capacity; reducing conflicts; improving public perceptions of aquaculture; or promoting the creation of management areas to facilitate certification. In the Mediterranean, the GFCM is promoting the concept of Allocated Zones for Aquaculture (AZAs), see reference of Sanchez-Jerez et al., 2016. In Europe, several projects financed by the European Commission are working on those issues, i.e. the EU H2020 project “AquaSpace –Making Space for Aquaculture”. In PART 3 – HIGHLIGHTS OF ONGOING STUDIES, aquaculture is dealt with mainly in the section about Realizing aquaculture’s potential, probably the richest section about aquaculture (starting page 144). SOFIA states how “Aquaculture has the potential to address the gap between aquatic food demand and supply and to help countries achieve their economic, social and environmental goals, thus contributing to the 2030 Agenda. However, the growth of aquaculture raises a number of questions in relation to the resources that it consumes (e.g. space, feedstuffs), its products and the threats that the sector faces from external factors such as climate change and diseases”. There are here references to Greenhouse Gas Emissions (GHG) in inland fisheries and aquaculture: “Greenhouse gas emissions from aquaculture remain relatively small, estimated to be 5 percent of those from agriculture (Waite et al., 2014), but have been growing because of increased use of feeds. Reducing fishmeal and fish oil use and feed conversion ratios (FCRs) can be important in minimizing emissions (Hasan and Soto, 2017)”. SOFIA reminds us how “The ability of aquaculture to meet future demand for food will to some extent depend on the availability of space”. Thus, SOFIA again addresses the issue of Aquaculture spatial planning, and refers to the Mediterranean and GFCM for promoting the concept of AZAs. It mentions how Aquaculture spatial planning offers many specific opportunities, quoting as the first “mapping the presence, absence and distribution of aquatic animal disease to support disease surveillance, zoning and risk assessment of disease spread (disease risk prevention and management). This section reviews the issue of Feed resources, and SOFIA wonders once more if “Given the projected increase in aquaculture production, are the trends in feed use sustainable?” Although most of global aquaculture (66 %), excluding aquatic plants, is produced using exogenous feed, the good news are that feed producers have diversified the sources of meal and oil, current feeds having significantly lower incorporation of fish meal and oil. Moreover, the proportion of fish from capture fisheries being reduced to fishmeal and fish oil has been declining in recent decades without preventing the growth of the aquaculture industry. It is projected that a growing share of fishmeal and fish oil production will be obtained from processing fish co-products (see figure 51). However, that may have effects as this source includes less protein and higher ash (minerals) content and small aminoacids (e.g. glycine, proline, hydroxyproline) in comparison with products obtained from whole fish. This section about Realizing aquaculture’s potential is completed with two subjects: Aquaculture biosecurity and aquatic animal health management and Climate-smart aquaculture. As for biosecurity, SOFIA reminds us to what extent the aquaculture sector is vulnerable to exotic, endemic and emerging disease epizootics, and how the responsible use of veterinary medicines, including antimicrobials, has benefits in terms of improved on-farm biosecurity and husbandry (e.g. through the use of vaccines and disinfectants). SOFIA insists on the subject and tells us how addressing biosecurity requires significant resources, strong political will and concerted international action and cooperation. Without national strategic planning for aquatic animal health and biosecurity, countries will remain vulnerable to new and emerging diseases. SOFIA is a clever girl, and reminds us that genetics and nutrition also play an important role in producing healthy, nutritious and resilient fish. [In MedAID Project, we have paid a lot of attention to SOFIA’s advices, and are therefore working on these important issues in Work Package 2 (Improving Zootechnical Performance) and Work Package 4 (Health management and diseases and fish welfare)]. FAO designed the concept of Climate-Smart Agriculture (CSA), which addresses the triple challenge of increasing productivity and adapting to climate change while reducing or removing greenhouse gas emissions (mitigation), where possible. Thus, some researchers and fish farmers are already looking at CSA as an alternative and innovative adaptation practice for increasing aquaculture production while avoiding adverse impact on sustainability. Here, Integrated MultiTrophic Aquaculture (IMTA) is presented as an example. The last section of Part 3 is about Sustainability certification in global markets. Here, SOFIA reminds us of the long road we still have to travel, according to Potts et al. (2016), as just around 14 percent of global production (both captured and farmed fish) was certified in 2015, and only 20 percent of the certified fish was from aquaculture. Sad news!! The last part of the report is PART 4 – OUTLOOK AND EMERGING ISSUES. Here aquaculture is addressed in two sections: The role of regional fishery bodies in aquaculture development and Projections of fisheries, aquaculture and markets. • target 3, Facilitate market-oriented aquaculture and enhance public perception. In the section about Projections of fisheries, aquaculture and markets, SOFIA informs us about the short-term projection model developed by FAO to assess and monitor potential fish demand and supply gaps over a five-year horizon, with the aim of facilitating evidence-based decision-making at the national, regional and global levels (Cai and Leung, 2017). The model includes: I) a demand-side component, which estimates the growth in fish demand; ii) a supply-side component, which estimates the trend in aquaculture growth; and iii) a set of indicators that measure gaps between demand and supply. Worthy to note that the benchmark fish supply is projected by assuming aquaculture production will follow the recent five-year trend while its capture fisheries production remains stable. This trend growth rate (4.5 percent annually) would not generate enough fish to satisfy the demand growth (9.9 percent per year) driven by income and population growth. Moreover, most of the growth will come from freshwater & diadromous finfish aquaculture. This group will produce 13.8 million tonnes more, representing 87 percent of its demand growth. Cai and Leung (2017) also predict that the trend growth in marine finfish aquaculture (550 000 tonnes) would be clearly below its expected demand growth of 11.2 million tonnes. In Table A (summary of demand-supply gap projections), in the Appendix, we can find data individualized by country. Not all Mediterranean countries are included, but many are. For some countries aquaculture would need to grow a lot to satisfy demand. That is the case of France needing to increase its production by 21 %, Spain by 19 % or Italy by 17 %, which makes me wonder: Where will all this fish come from? SOFIA report ends with the REFERENCES section, which is full of very useful and interesting references of updated reports, articles and other publications, and AH!! 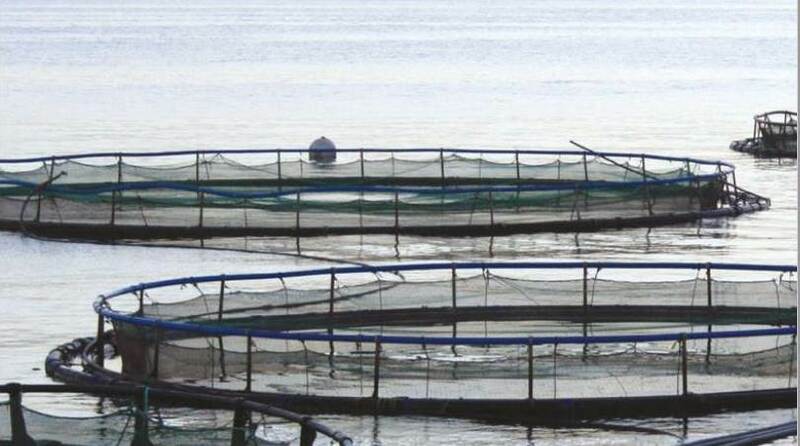 it is illustrated with a photo from the Mediterranean (Fish farming in floating cages from Cyprus).